Still images from the Proceedings of the Royal Society B article. ONCE THOUGHT TO BE A SPARSELY INHABITED ENVIRONMENT, the ocean’s deep waters – at least within the California Current off central California – are actually a highly active habitat of predators like squids, sea jellies and other creatures, according to a study by researchers at the Monteray Bay Aquarium Research Institute, based in Moss Landing, CA. Screen shot (and link) from MBARI’s awesome video. They published their study in the Proceedings of the Royal Society B, described the work in a more reader-friendly article on their own website and posted an awesome video on YouTube. The research team reviewed 27 years’ worth (1991–2016) of feeding observations collected by remotely operated vehicles (ROVs) to analyze the food web in the region. They studied 743 feeding events from near-surface waters down to depths approaching some 13,000 ft/4,000 m, involving 84 different predators and 82 different prey types. The combination discerned a total of 242 unique feeding relationships. 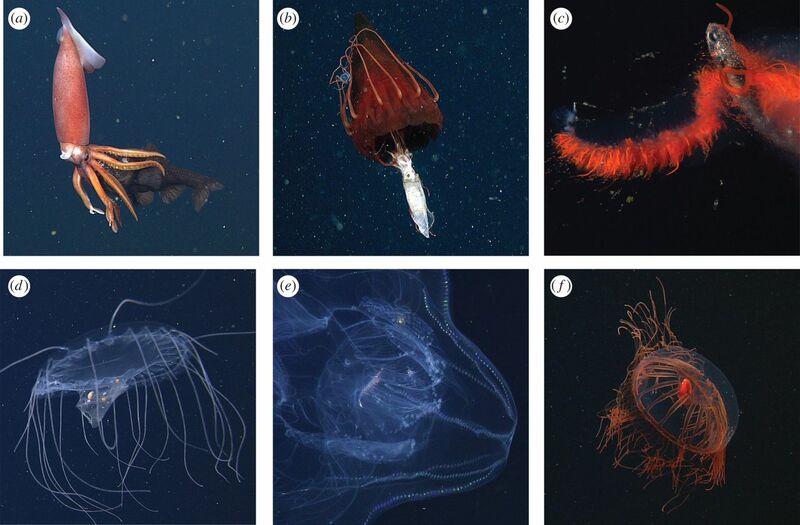 Among their findings: the importance of the “jelly web” of medusae, ctenophores and siphonophores as key predators as significant to the ecosystem as large fish and squid species.